The Borneo Diary #1: The Beginning of an Eco-Battle! She looked into my eyes as they swelled up with tears, gently stroking my face as if to wipe the tears away. I ran to her to escape my problems. Everything seemed too much to bear. Here I was half way around the world with a small group of young people attempting to end deforestation in the Borneo rainforest, the oldest rainforest on Earth yet one of the most threatened. There was so much responsibility on our shoulders. The Indigenous people of Borneo were relying on us to help protect their land and their livelihoods. The forests were depending on us, disappearing quickly with bulldozers on the way. The climate was aching for us, with “carbon bombs” ticking away as gases slowly release from each falling tree. But we were only a group of 15 young people, what could we really do? This was the question, the question of our times. This was the test, the test of our generation. To save the Borneo rainforest; to win one of the few battles we have left in this world; and to steer humanity off a destructive path. However, in that moment, I wasn’t sure whether we could pass the test. We had already made a change. A change for the life of this one creature in front of me. 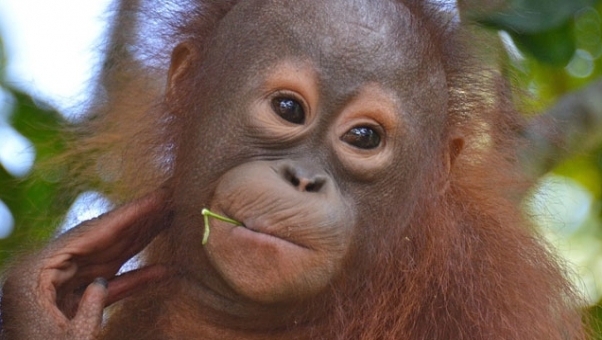 Her name was Jojo and she is a baby Orangutan we had rescued. We found her in a small wooden box with nails spiking out. She was sick and terribly afraid. But now she was being looked after with our care at our rescue centre. This of course was only a beginning, we had hoped to do much more. But it was a turning point in this campaign. For this showed us that we could make a difference. We can make change. And that a new battle was ahead. A great eco-battle we must fight. A battle we must win!